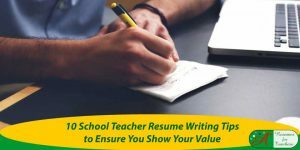 Education resume formatting is an essential aspect of gaining a teacher interview. 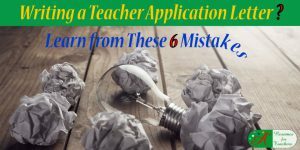 How your teacher resume looks, sounds, and comes across, will determine whether or not you advance to the next round of the job application process. 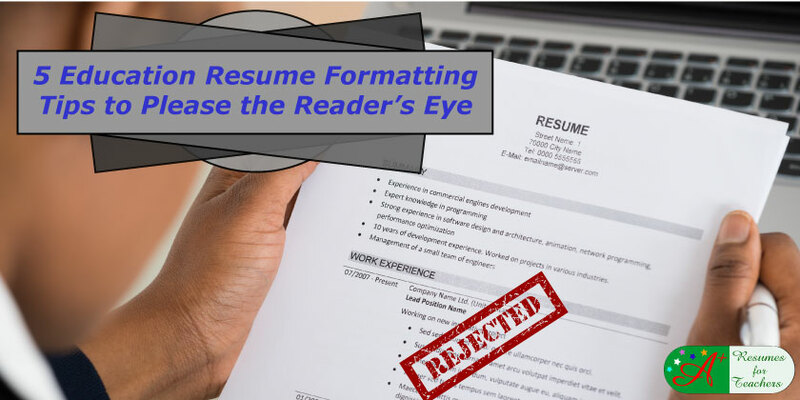 If your resume or CV is cluttered, unappealing to the eye, or incomprehensible, you will surely get tossed in the “No” pile, regardless of your qualifications. 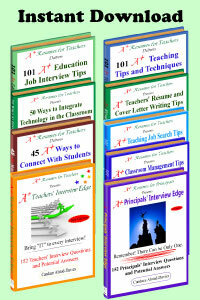 Below you will discover five proven tips to grab the reader’s eye and attention and land an education interview. 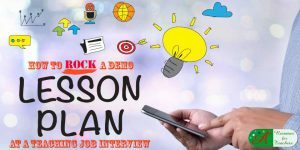 At this stage, you will need to brush up your interview skills by reading these education job interview tips to land a job offer quickly. 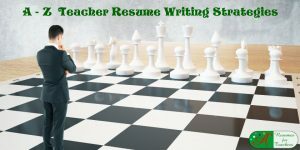 Use of white space is key in education resume formatting. White space, also known as negative space, consists of margins, space between paragraphs and sections, and the other areas lacking text and markings. This technique allows for a better-organized document, which is easier to read and decipher and draws the reader’s eye to the appropriate areas. Integrate white space accordingly to help keep the reader on track and subconsciously direct him/her to important points in your document. The use of section headings is one of the easiest ways to break down information into a clear and cohesive manner. 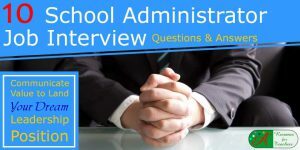 For instance, all of your formal education and credentials should appear in the same area, entitled, “Education and Credentials.” If a hiring administrator is looking for specific education, experience, or skills, he/she can find that information quickly and easily. Another important part of education resume formatting is bullet points. Bullets allow you to present a list of data in an organized and easy-to-read manner, this could be a list of relevant education transferable skills. It is also an excellent way to grab the reader’s attention and draw it to certain topics. For example, under Professional Experience, you will want to list each relevant job you have held (including job title, school, location, and dates employed), in addition to correlating job responsibilities and achievements. The education career achievements should be listed in bullet point format to make them truly stand out, and concretely demonstrate your ability to do an excellent job in the classroom. Throughout this section, you will need to incorporate keywords relevant to the position you are seeking. 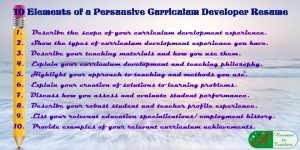 The education career achievements should be listed in bullet point format to make them truly stand out, and concretely demonstrate your ability to do an excellent job in the classroom. The most important details you could possibly include in your instructor resume are your name and contact information – if potential employers don’t know how to get ahold of you, you will miss out on what might be an incredible job opportunity! Your name should appear right at the top of your job application documents, as well as clearly labeled contact info (mailing address, home phone number, cell phone, email address, and LinkedIn page). The next crucial piece you must highlight is your desired position, i.e. Elementary School Teacher, High School Mathematics Teacher, Early Childhood Teacher, Educational Administrator, Education Consultant, and so forth. If you are open to various positions, you may want to say “Professional Educator,” with the grade levels or subjects tactfully listed below. Color can be visually appealing if used properly. If you are incorporating more than black text, which is standard for the body of a resume, make sure you choose only one other color. Using too many colors in your education resume formatting can lead to confusion and look childish. You may want to make your name, desired position, and/or section heading a different color than the rest of the text. If you are adding a border to your document, make sure it is either black, the same color as the text, or complements the text nnicely Again, choose a professional border to ensure your document does not look immature. 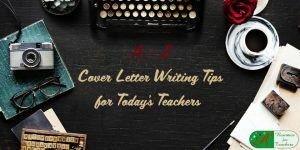 Your cover letter, resume, and other job applications documents should all adhere to the same formatting to maintain consistency and uniformity. Resume formatting techniques vary depending on the individual. Incorporating relevant graphics is also a good way to stand out from your competition, grab the interviewer’s attention, and make yourself a more memorable job candidate. Graphics or icons should be placed in your top header, alongside your name and contact information. Make sure they are relevant, professional, and relatively simple. Below is a list of teaching positions and correlating sample icons you may wish to integrate. 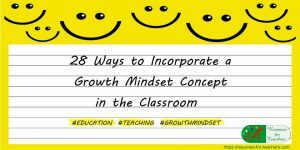 Below is a list of instruction posts and corresponding sample images you may want to incorporate. You can review sample teacher resumes we created to get a visual view of different formats and design elements. 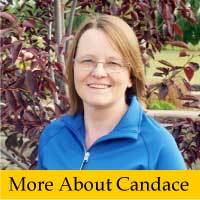 If you need help we are just a phone call (1 877 738-8052) or email Candace or jump to our education resume services page.